Google has announced that it will spend $13bn to build new data centers and offices as it expands its presence across several key locations in the US. The company’s CEO Sundar Pichai explained in a blog post that the search giant will open new data centers in Nevada, Ohio, Texas and Nebraska. 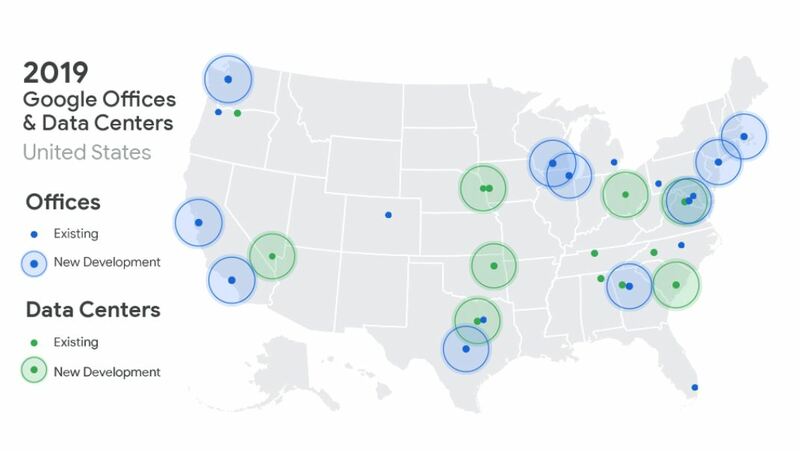 This will be Google’s first time having infrastructure locations in those states and it will also be adding staff to its existing offices. In Virginia, the company plans to double its workforce, add more data center space and open a new office. Google’s New York campus at Hudson Square will also be expanded as it looks to build up its power on the East Coast. As the cloud wars between Amazon, Microsoft and Google heat up, Google’s decision to bolster its cloud computing division by building more data centers makes a great deal of sense especially as Google search, Gmail and YouTube all rely on its data centers as well. Google’s capital spending more than doubled last year to reach $25.46bn and if today’s announcement is any indicator, it will likely end up increasing this year as well.